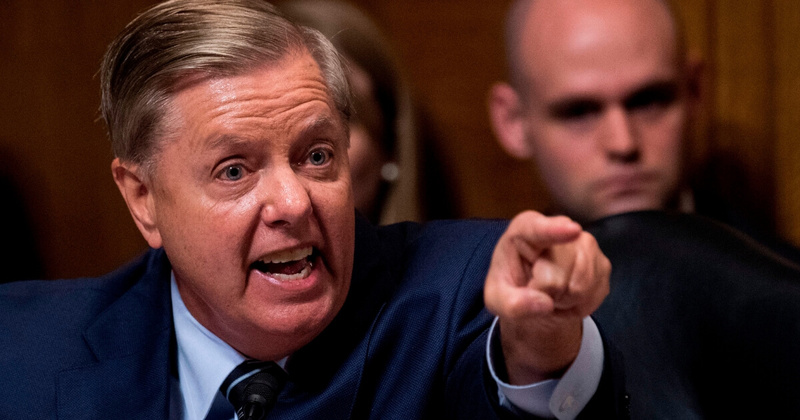 Sen. Lindsey Graham delivered a rousing speech behind closed doors at Mar-a-Lago on Friday night, joking about the prospect of President Donald Trump opening a hotel in Jerusalem and asking the crowd whether they’d like to see former Rep. Trey Gowdy on the Supreme Court. With Trump looking on, Graham lavished the president with praise, ticking off a list of his accomplishments, including the booming economy, the elimination of Islamic State strongholds in Syria and Trump’s decision to move the U.S. embassy in Israel to Jerusalem. “There will be a Trump hotel there in 10 years,” Graham said, according to three people present for his remarks. […]Graham spoke for about 30 minutes, according to another person who attended the event. Trump remained in the room for the senator’s remarks, and left soon after. The senator repeatedly tossed out what one of the attendees called “red meat” for the conservative crowd, calling for an investigation into Hillary Clinton and the circumstances surrounding the creation of a largely unverified dossier about Trump’s alleged ties to Russia. He also complained about alleged Foreign Intelligence Surveillance Act abuse, an issue that he is investigating as chairman of the Senate Judiciary Committee. They’ll do this as a way to counteract the hearings in the House. It’s a smart plan. The press and the Democrats will be distracted and the country will be even more polarized, which suits the Republicans just fine. It will also serve to enable the Trumpies in the FBI, particularly those in New York whom we know are sympathetic, to do whatever it akes to thwart any SDNY investigations.